I’m a pig. A big, fat pig. I am also quite full. We had previously enjoyed a quite pricey meal at Street and wanted a less expensive affair. We managed to decrease the bill by $10 bucks each. It’s a start! 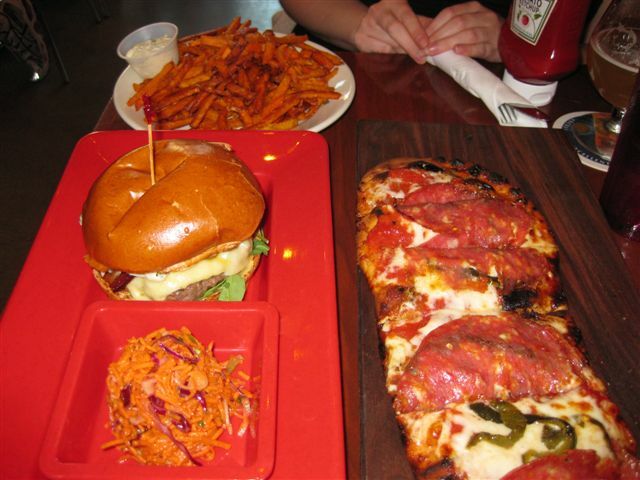 Lucky Devil’s is another in the line of upscale burger joints. And I feel the need to try each and every one of them. It’s my patriotic duty, for Pete’s sake! The crowd here is 75% hungry male, 20% dorky tourist (it’s located blocks from Mann’s Chinese Theater) and 5% Miscellaneous (us). 1. Burger patty was very thick, expertly cooked. Not as soggy as Kobe beef can be. The brioche bun did NOT fall apart. Success! Cole slaw was heavy on carrots (a good thing), spicy. I liked it. 2. A shitload of fries, many of them thin, short and crispy. We didn’t finish them. I couldn’t help but think of the poverty striken children of the world that don’t even get half the portion of sweet potato fries that we did. 3. I’m a lover of flatbread pizza. This was a good one, very crispy. The ends were burnt. I like it that way, my friend did not. I continued to consume it, even as my belly began to distend. 4. Beers were good. Mmm. Beer.